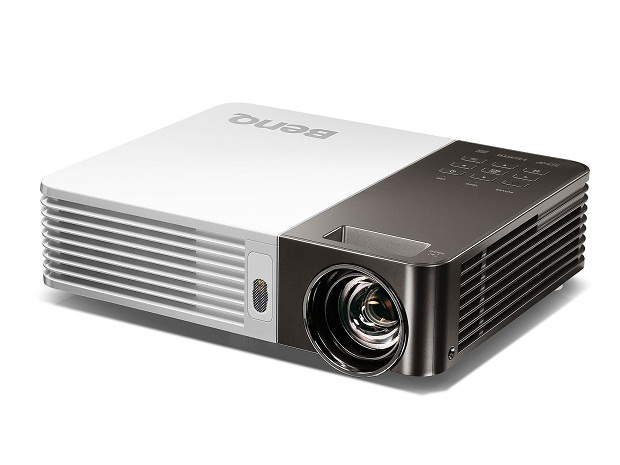 Wireless Big-Screen Ultra Lite LED Projector BenQ GP10 Launched In India! BenQ, an internationally renowned provider of digital lifestyle innovations and No.1 Projector brand of India unveiled today its latest creation, a brand new product aiming to turn every room in the house into an instant audiovisual retreat where families can enjoy each other’s company spontaneously: the GP10 Ultra-Lite Wireless LED projector. Highly power-efficient 3LED projection technology. For home users seeking hassle-free, big-screen enjoyment, thetiny1.5kgGP10 is a revolutionary device which comes with highly power-efficient LED projection technology,720p HD-ready short-throw projection, 30000 hrs. LED Light Source, 3D-ready, 550 ANSI lumen brightness, optional detachable DVD player, HDMI multimedia connectivity, USB multiple format support for movies, pictures & music, Wireless Display, SD card slot, and two built-in 3W stereo speakers with SRS.GP10 also comes with optional detachable DVD player which makes the entertainment in wire free living-room a reality. “Home entertainment is continuously changing the way families consume audio visual content in form of movies, television channels, games etc, keeping that in mind we are launching BenQ GP10 our 550 lumens ultra-lite LED projector in India. The incredible device makes enjoying all forms of entertainment wirelessly with optimal performance to create a big screen home cinema experience for families. It is backed with 30,000 hrs of LED light source& GP10 is capable to give consumers a decade of hassle free crystal clear BIG SCREEN visual entertainment” said, Rajeev Singh, Country Head & General Manager, BenQ India. The GP10 is capable of projecting a big 160” 720p HD-quality picture, this Ultra-Lite Wireless LED projector will fit perfectly injust about any room of the house, even the attic or tree house.It is LED-powered with an enhanced 550 ANSI lumen brightness, 10,000:1 contrast ratio and 100% NTSC wide color gamut performance – which means, movie enthusiasts and game lovers can expect an extra pleasing visual experience filled with vividly clear details and true-to-life hues. Another advantage of utilizing LEDs as a light source is that it’s highly energy efficient. To provide a comprehensive home entertainment experience, the GP10 is equipped with versatile multimedia connectivity to support DVD players, DTH & Set-top boxes, PCs, tablet PCs, gaming consoles and Apple devices. Needless to say, the GP10 truly has everything you can think of for the whole family to have big-time fun together wherever and whenever they want. Nokia and Microsoft are Parterns now!! 4 Best Gaming Laptops under Rs 60,000 Available On Amazon Great Indian Festival Sale! Overcart Now Offers OnePlus One Unboxed for Indian Customers!